Dec 05 Comments Off on Don’t sweat it, forget it! Is your confidence compromised by constant and excessive sweating? Anxious about performing the simplest of tasks for the fear of embarrassing sweat stains? Don’t sweat it, forget it. Excessive sweating, or Hyperhidrosis, can be embarrassing but also easily resolved. The solution is simple – anti-wrinkle injections. While we understand some have reservations about needles, here at Refine Clinic our clinicians take the most refined approach to making you as comfortable as possible. While 3% of Australians suffer from Hyperhidrosis, there are more recent confirmation that many that affected by hyperhidrosis do not seek medical advice and solutions. This excessive sweating is usually noticed in conditions and stimulants other than heat which can become a detriment to confidence and self-esteem. Most people affected with hyperhidrosis find that there is a heightened level of anxiety when it comes to performing regular work activities, and the symptoms greatly impact their work and business development. There can be also be a growing frustration and fear undertaking the most simplest of daily activities. Anti-wrinkle injections are an approved treatment for hyperhidrosis as it relaxes the muscles around the sweat glads, essentially freezing them in place. Refine Clinic is offering a Xmas miracle to those struggling with this social anxiety inducing condition – allowing you to shine confidence in the face of the entire family over the holiday period. Sweating is a very natural occurrence, there are many catalysts for hyperhidrosis including diabetes, menopause, infection, nerve and heart problems. General sweating can happen frequently in everyone especially in warm weather or when performing physical activity, sometimes being more noticeable in certain people than others. This excessive sweating does not need to be a part of your anxious conscience. While there are obviously different intestines of sweating, with injectable treatments you no longer have to sweat it. Perform activities, that would usually leave you drenched, dry as a bone. For a limited time only, treat your excessive sweating for just $1,200 – T&Cs apply. ZO skin health offers a multitude of dermatologist approved products that help a variety of skin concerns. Through applying a protective layer to the skin that helps negate the chronological ageing of skin by promoting cellular function and restoration. The properties emulated in these products not only target the typical signs of ageing however are used as a holistic approach to many skin concerns – for the purpose of today, Rosecea. Rosacea is a common chronic inflammatory skin disease that can cause severe redness and emotional distress. ZO skin health products and programs organised by professionals to provide that extra layer of protection to the skin, targeting these stages of Rosacea to bring you a new found confidence to your skin. While Rosacea is non-harmful there are indiscreet manifestations that we know can cause a serious dent in ones self-esteem. Rosacea is non-contagious and typically is isolated in the facial region, with little known cause or cure. While no complete and total cure has been found for Rosacea, that does not mean there are not ways to manage the appearance and comfortability of living with the condition. Incurable diseases do not always mean unmanageable. ZO skin health offers different programs of different intensities to target different concerns including Rosacea. These programs rage from daily skin routines to aggressive skin revitalisation, so different levels of skin concerns can be treated at different levels. 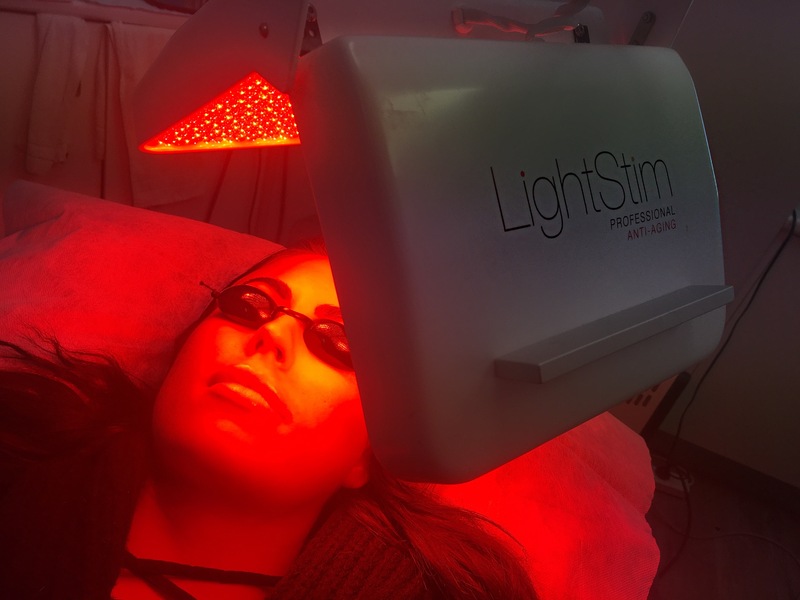 For the extra edge on finding the solution that works for you, there have been different theorised lifestyle changes that can be made to relieve the signs of redness such as avoiding alcohol and limiting sun damage however the principle treatment plan has been laser. To apply a compounded solution through changed lifestyle choices will more than likely reveal better results in conjunction with a daily skin routine that is targeting your signs and concerns. The emotional toll and psychological distress caused from a visual and indiscreet disease is significant. By doing nothing the effects and symptoms are only being nurtured and feeding into expanding and accumulating more symptoms. It is best if you have any signs of these symptoms to seek solutions to help manage them to the best possibility. For those who may not be ready for the invasiveness or lengthy downtime that comes with a traditional, surgical face and neck lift, there is now an in-clinic solution which can leave you looking more youthful in as little as one treatment. Our Thermage treatments at Refine Cosmetic Clinic removes the complexities from surgical skin tightening and lifting procedures, providing patients with natural-looking results and minimal downtime. Using reliable Radio Frequency technology to heat the skin, Thermage treatments work to remodel your existing collagen makeup deep in your skin’s layers. This technology causes your collagen to tense, lift and tighten. In just one treatment, this contraction improves the appearance and quality of your skin, repairing typical damage associated with ageing and correcting the appearance of sagging skin. Our patients have described their Thermage treatments as a warm, slightly tingling sensation – completely comfortable and almost relaxing. For those patients who are just beginning their anti-ageing journey and may be a bit nervous about pain, Thermage treatments are a great starting point requiring no anaesthetic and little downtime. After just one treatment, you will see a distinctive change in the elasticity and tone of your skin due to the contraction of collagen beneath the surface. With a course of treatments, you will not look dramatically and obviously different, but instead naturally rejuvenated and more youthful. Some results may be seen immediately after your treatment, improving over the following 9 months, and lasting for up to 2 years. Interested in trying Thermage? For a limited time only, treat your full face and neck with Thermage, and receive three follow-up LED Light Therapy Treatments (valued at $300) for just $2,800. Has your body changed after childbirth? We see many women who love being mums, but are keen to restore their bodies through a ‘mummy makeover’. Motherhood is undeniably one of life’s most rewarding experiences’ however it can take a toll on the body with many new mothers experiencing loose skin, Diatasis Recti (abdominal muscle separation), stubborn fat deposits as well as sagging and deflated breast tissue. Mummy makeovers are generally known as a combination of breast surgery and a tummy tuck and are fast becoming the go to choice for a high percentage of women post pregnancy. Mummy makeovers aren’t purely cosmetic as most women view them as corrective procedures. They aren’t trying to look better than they’ve ever looked before, they just want to go back to how they looked before pregnancy, restoring their bodies to what they had. For example breast reduction, breast lifts and breast augmentations are popular choices for new mums. The degree of change women experience in their breast tissue can depend on whether they have breastfed, and the duration of their breastfeeding. The longer a woman has chosen to breastfeed, the more dramatic the changes in the appearance of her breasts. For women who have experienced descending breast tissue and some volume loss, a breast lift may be combined with a breast augmentation. If there are no changes in volume, a breast lift may be sufficient. Another area most affected by pregnancy is the abdominal area. As the uterus expands during pregnancy, pressure is placed on the abdominal wall causes both the muscles and skin to expand resulting in laxity. These excess folds of skin can be unresponsive to diet and exercise. Abdominoplasty or a ‘tummy tuck’ allows the doctor to completely remodel the patients’ core and waistline through repair of the muscle separation and the removal of excess skin and fat. This procedure can also be combined with liposuction to achieve optimal results. Liposuction is also popular for new mums in common problem areas that become more prominent post-pregnancy such as love handles, inner and outer thighs. • Speeds up the process of wound healing. • Treats the loss of collagen and elastin that occurs with ageing skin. • Minimises the appearance of pores, fine lines and wrinkles. • Diminishes bruising, swelling and redness after cosmetic procedures such as fillers. • Enhances the benefits of salon services such as facials, microdermabrasion, and skin needling. • Treats pain and inflammation including muscle and joint pain, arthritic pain and stiffness. • Produces a radiant glow and tones the skin. LightStim LED Therapy is an FDA approved professional treatment which involves positioning the LED LightStim device over the area of concern. The device emits light energy which is absorbed by the cells in the skin. This triggers the metabolic activity of these cells. As a result the cells synthesize DNA and RNA. The cells also produce enzymes to regenerate old cells and the production of new cells occurs. 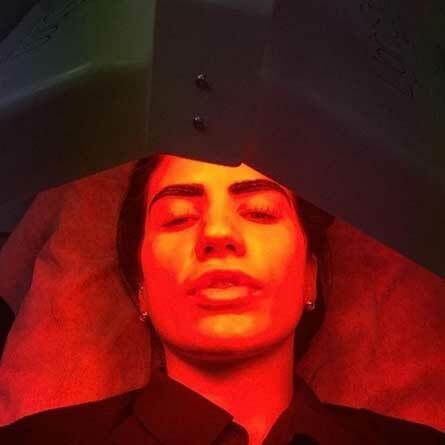 The LED light reduces inflammation and increases blood circulation in the treated area. 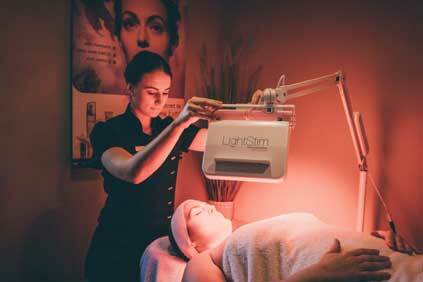 The LED light also stimulates the production of collagen and elastin within the cells, plumping and firming the skin. The client will usually remain under the LED light for approximately 15-20 minutes. The number of treatments varies according to the condition being treated. Regular treatments are recommended for the best results. Who is LED therapy suitable for? • Anyone who has recently had a procedure done and wishes to speed up the body’s healing process, whilst reducing any redness, swelling and bruising. • Anyone concerned with the appearance of scars. • Those who are suffering from joint, muscle or arthritic pain. • Anyone who is looking to prevent and minimise the signs of skin ageing. • Those looking to enhance the effects of their salon services e.g. microdermabrasion. Anyone who is concerned about dull skin tone. 4 Light Therapy sessions for $180 (normally $396). To book your LED light therapy contact Refine Cosmetic Clinic on 8599 7161. • Anyone who is concerned about dull skin tone. 4 Light Therapy sessions for $180 (normally $396). To book your LED light therapy contact Refine Cosmetic Clinic on 8599 7161. Aug 07 Comments Off on Introducing Cosmelan- The most effective depigmentation treatment! Introducing Cosmelan- The most effective depigmentation treatment! Cosmelan® is a professional depigmentation method which has an intensive corrective effect on skin hyperpigmentation’s whilst regulating the overproduction of melanin in the melanocytes, inhibiting and controlling the appearance of new dark spots. Its efficacy is based on its double mechanism of action that on the one part has a corrective effect, eliminating the hyperpigmentation and, on the other, a regulating effect, controlling the overproduction of melanin and in this way preventing the appearance of new spots in the long term. 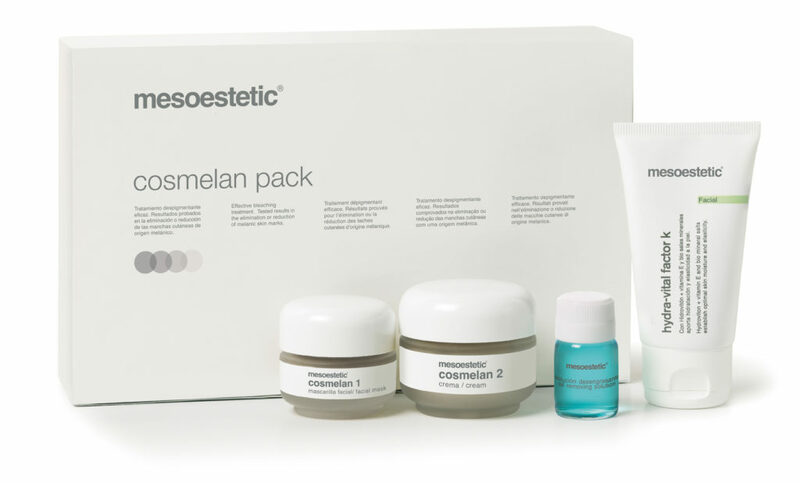 More than a treatment, Cosmelan® is a complete method that involves a single session, which can be performed at beauty clinics and dermatological or aesthetic medicine practices, and a home maintenance treatment. The session entails the professional applying the cosmelan 1 face mask which is then left to work for 8 to 12 hours, according to the phototype and sensitivity of the skin to be treated. After this time has elapsed the mask is removed at home. 48 hours later, the follow-up phase in your home is started with the application of the cosmelan 2, hydra-vital factor K cream and the moisturizing sun protection SPF50+ . This follow-up phase is carried out for 7 months to achieve an optimal result and prevent the reappearance of spots. Poikiloderma of civatte was first described in 1923 and refers to redness and mottled pigment on sides of neck. The area under chin is usually unaffected. This condition is more commonly seen in women and in areas of high UV exposure. What causes poikiloderma of civatte? The cause of Poikiloderma of Civatte is unknown. However, fair skin, sun exposure, hormonal factors and some components of cosmetics and toiletries (photosensitising components) are all thought to play a part in the development of the condition. What does poikiloderma of civatte look like? Skin thinning (atrophy), redness from enlarged blood vessels (erythema) and colour (pigmentary) changes are seen in sun-exposed skin. Poikiloderma of civatte most commonly affects the sides of the neck whilst the area under the neck remains characteristically unaffected. Poikiloderma of civatte may also affect other areas on the face. What other problems can occur with poikiloderma of civatte? There are no known medical problems associated with the condition. Similar changes on the neck may be seen in genetic skin conditions such as Rothmund-Thomson syndrome, Bloom syndrome and connective tissue diseases (such as dermatomyositis, lupus erythematosus and mycosis fungoides). Similar changes may also be seen in skin that has been treated previously with radiotherapy. How is poikiloderma of civatte diagnosed? The diagnosis is usually made by looking at and assessing the skin. No formal tests are required. In some cases a skin biopsy and/or blood tests are needed to exclude other conditions which have a similar appearance. While a combination of treatments is often recommended, Intense Pulsed Light (IPL) treatments will help reduce both redness and pigmentation. Treatments with IPL will also help stimulate collagen production, thereby improving skin tightening and promoting anti-aging. Chemical Peels: the hyper pigmentation associated with Poikiloderma often resides deep within the epidermal-dermal layers. A course of skin peels may be useful to resurface damaged skin, improving skin complexion as well as the appropriate use of homecare. Antioxidants are important for minimising cellular damage and slowing the progression of photo ageing. We recommend ZO Skin Health’s Daily Power Defense and C Bright to assist with hydration, skin barrier restoration, as well as fine lines and wrinkles. Pigment Inhibitors and Skin Lightening Agents are great to help even out the skin tone and prevent the formation of new pigmentation, as well as improving the texture of the skin. We recommend ZO Skin Health’s Brightenex and C Bright Serums, as both assist with the treatment of hyperpigmentation and sun damage. Skin Cell Resurfacing Agents and Collagen Stimulants such as ZO Skin Health’s Radical Night Repair (1% Retinol) will support collagen, improve skins brightness and prevent future skin damage, among many other benefits. Additionally, ZO Skin Health’s Growth Factor Serum will promote cell turnover, to help smooth the skin and provide a more even skin tone. It will also provide antioxidant protection against free radical damage, as well as other great benefits. Sun Protection- It is highly recommended to use a sun block daily, at least 30+. We recommend ZO Skin Health’s Oclipse Sunscreen and Primer as it is fragrance free and provides a 12 hour release of antioxidant protection. It also helps to minimize inflammation, restore hydration and enhance the skins barrier. With a tint and silky matte finish, it will assist in reducing the appearance of skin imperfections. Taking time off post-surgery doesn’t have to be mundane and boring. There are some great ways to put your down time at home to good use; I mean, how often do you get time to literally just do NOTHING? While you are at home recovering, we have compiled a list of some great ways to beat the boredom! Binge Watch: Now is the best time to take advantage of catching up on all those Netflix, Stan or online shows you have wanted to watch. During the work week commitments often get the better of us and by the time the weekend is here we often spend time out of the house being social with friends and family we haven’t seen. Post-surgery is the perfect time to sit back, sloth around at home and really get into that latest season of Orange is the New Black or Keeping up with the Kardashians! Get Creative: Sometimes having time off and being forced to just rest at home means you can make time for things you have never thought of before. Why not start a blog or journal? Do a cross word puzzle online or play scrabble on the iPad to get your mind working. If you really want to be proactive, now is the perfect time to clear out all those annoying old emails or documents on your computer you have always wanted to sort out. Being in recovery means you cannot be over active, so why not get cosy on the couch and open up that laptop for some much needed leisure time. Music: Enjoy your time at home by putting on some great music and just relaxing. If you have a garden or balcony, why not sit outside for some fresh air which is always an important part to recovery, hit that Spotify playlist of your choice and zone out. Nap: Now is your chance to take advantage of those much loved sleep in’s. We all long for those soft clouds known as pillows when we are run off our feet at work, so if you have to be at home recovering, why not enjoy a sweet siesta. Friends: Even though you can’t be up and out rushing around, people can still come and visit you. Give your friends a call and see if they’re free to pop over. You could always arrange a little movie night in, with some snacks and a cosy couch. There is nothing like good company when your post op at home.